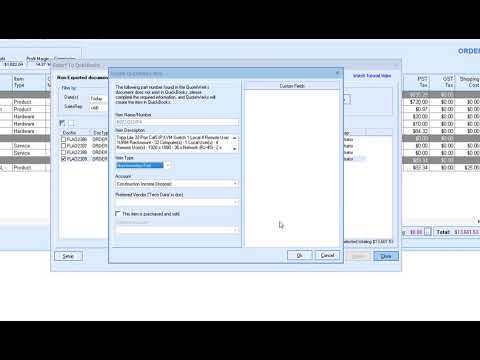 Demonstrates the QuoteWerks PO integration with QuickBooks. QuickBooks 2019, 2018, 2017, 2016, 2015, 2014, 2013, 2012, 2011, 2010, 2009, 2008, 2007, 2006, 2005, 2004, and 2003 Pro/Premier/Enterprise. The Basic editions of QuickBooks do not allow external applications to integrate with them, so QuoteWerks cannot integrate with them. QuickBooks 2017, 2016, 2015, 2014, 2013, 2012, 2011, 2010, 2009, 2008, 2007, 2006, 2005, 2004, and 2003 Pro/Premier/Enterprise editions. The 'Basic' editions of QuickBooks do not allow external applications to integrate with them, so QuoteWerks cannot integrate with them. QuoteWerks integrates with the 2008 Canadian and 2008 Canadian multi-currency editions. QuickBooks 2016, 2014, 2013, 2012, 2011, 2010, 2009, 2008, 2007, 2006, and 2005 Pro/Accountant editions. The 'Basic' editions of QuickBooks do not allow external applications to integrate with them, so QuoteWerks cannot integrate with them. Disclaimer: The UK division of Intuit (the makers of QuickBooks) does not provide support for their QuickBooks UK API to companies like Aspire Technologies, Inc. (the makers of QuoteWerks) that write integrations into the UK version of QuickBooks. What that means is that if Aspire runs into a problem integrating QuoteWerks with the UK version of QuickBooks, Aspire will not be able to receive assistance from Intuit on the issue. Because of this lack of support by Intuit we can offer the QuickBooks UK link, but only as-is. We cannot guarantee that any issues reported will be fixed in a timely fashion, although we will do our best to do so. The QuickBooks USA API and the QuickBooks Canada API on the other hand are supported by Intuit and therefore we can support issues that arise with those versions. QuickBooks 2016, 2011, 2010, 2009, 2008, 2007, 2006, and 2005 Pro/Accountant editions. The 'Basic' editions of QuickBooks do not allow external applications to integrate with them, so QuoteWerks cannot integrate with them. Disclaimer: The QuickBooks UK version disclaimer also applies to the Asia Pacific Version of QuickBooks. Looking for the Reckon Accounts Desktop integration? Looking for the QuickBooks Online integration? The QuoteWerks QuickBooks integration is only available in the Professional Edition of QuoteWerks and higher. View screenshots of the QuoteWerks to QuickBooks link. QuoteWerks can search QuickBooks for contacts to be used on Quotes. QuoteWerks can link to and search the QuickBooks item list, so you can add QuickBooks items to your quote. Exports your QuoteWerks documents to QuickBooks estimates, sales orders, or invoices one at a time, or in batches. When selling the same Item outright versus accepting monthly payments for the Item, QuoteWerks can automatically associate them with different income and asset accounts in QuickBooks. When the document is exported, you can set a default tax item name to use with all exported documents, or you can be prompted to select the tax item name for each document exported. QuickBooks custom fields are supported. 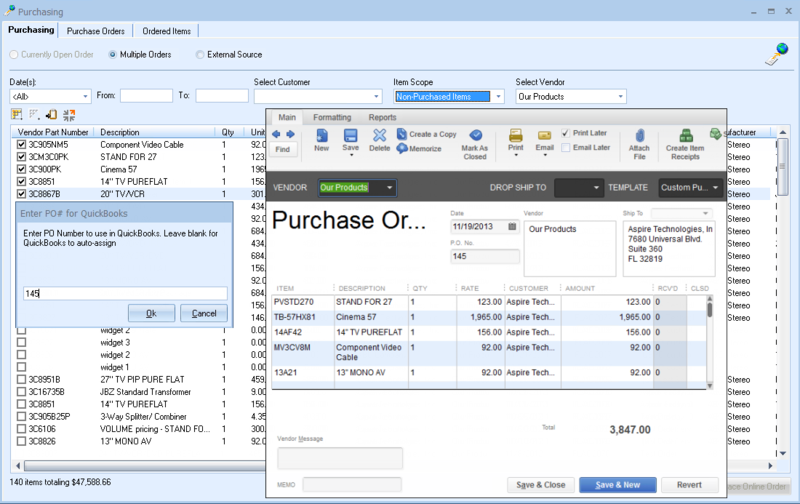 Exports your Purchase Orders to QuickBooks. You can quickly see all of the unordered items in QuoteWerks and can easily create QuickBooks Purchase Orders that contain items from one or multiple Orders in QuoteWerks. Items that do not exist in QuickBooks will be created, and the QuickBooks Purchase Order number will be written back into the line items from the orders. Additionally if you are using the Online Ordering feature of the real-time module, after the items are ordered you will be asked if you want to create a Purchase Order in QuickBooks for the items you just ordered electronically through distribution. When selling the same Item outright versus accepting monthly payments for the Item, QuoteWerks can automatically associate them with different income and asset accounts in QuickBooks. 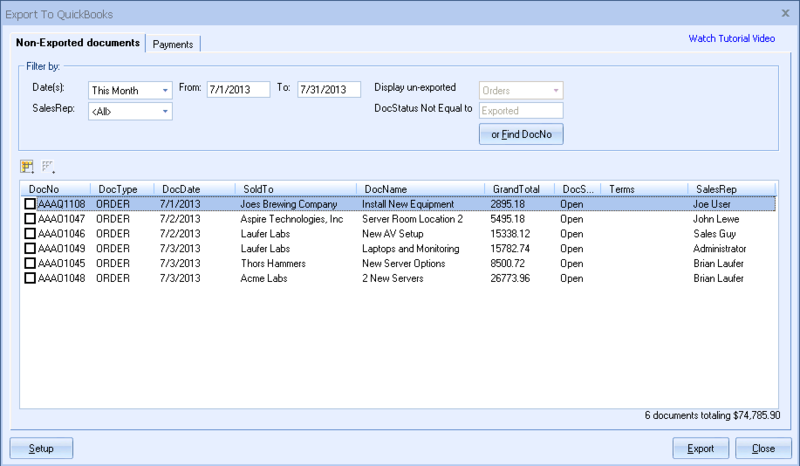 Creates Item Receipts in QuickBooks when receiving items on the QuoteWerks Purchasing window. If the customer in the QuoteWerks document does not exist in QuickBooks, it will be automatically created. If the customer already exists in QuickBooks, the customer information can be optionally updated automatically. QuickBooks custom fields are supported. If items/parts in the QuoteWerks document do not exist in QuickBooks, you will be prompted to select the type of item it is (Inventory, Non-inventory, or Service), and you will be prompted to select the income/expense account to be associated with this new item. When QuoteWerks creates Items in QuickBooks, it populates most of the fields you typically use like the Preferred Vendor field. If you use your own part numbers in QuickBooks instead of manufacturer part numbers, QuoteWerks can work with your system, even helping you auto-generate your own proprietary QuickBooks part numbers. QuickBooks custom fields are supported. If other details such as terms and ship via do not exist in QuickBooks, they are automatically created. Documents exported to QuickBooks are marked as exported so you will know which documents have been exported, and which have not. I already use QuickBooks, how will QuoteWerks complement QuickBooks? • QuickBooks has a combined limit of 14,500 customer, products, vendors, and employees (sales reps). The limit of the Enterprise Edition of QuickBooks is 29,000. Once you reach the limit, you would have to delete products and any documents the items appeared on before you can quote new items. QuoteWerks does not have any limits on the number of customers/prospects, products, or vendors it supports. • QuoteWerks enables remote sales reps to create quotes and synchronize them back to the main office where they can be imported into the primary database. QuickBooks has no support for remote users or offices creating quotes/estimates. QuoteWerks offers a complete security package for quoting needs. You can limit which menus are available, the ability to modify products, layouts, reports, etc., and access to other users documents. QuickBooks security features are very basic in the sense you can either provide access or not. You do not have many options. What does the QuickBooks link cost? The QuickBooks integration is included in the Professional and Corporate Editions. If I purchase a multiple-user license of QuoteWerks, do I need to buy multiple copies of the QuickBooks link? 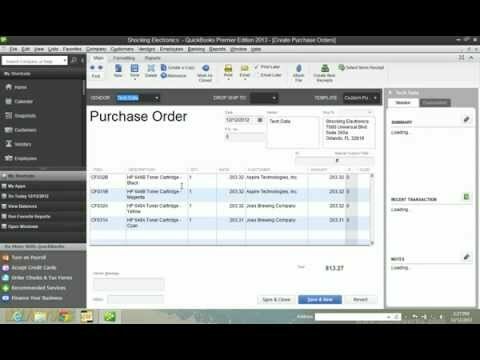 Can I get a demo version of the QuickBooks link? Yes. The QuickBooks link can be evaluated using the demo version of QuoteWerks. You can use the QuickBooks link by selecting the Tools->Export to QuickBooks menu in QuoteWerks. You can download the demo version of QuoteWerks by clicking here. How to setup and use the QuickBooks link is documented in the QuoteWerks Help File accessed by selecting the QuoteWerks Help->QuoteWerks Help.